A slow video amble along a short stretch of canal #narrowboat #offgrid #england – The Diesel-Electric Elephant Company. … a couple of boats have passed me in the opposite direction, their midshipmen squinting into the setting sun to little avail. We are heading, methinks, into terra nova for us, onto stretches of the network that won’t be closed for winter stoppages and repairs. A few weeks’ mooch in this direction and then the stoppages alternate, and the Cardinal and I must of necessity mooch back on ourselves into the sunset and beyond again. Today’s move was a short one, about one mile plus one lock and a visit to the nice services at Venetian Hire, for water, coal, gazunder-emptying and a fumble through their comestibles (to add to the winter-season stockpile in the Cardinal’s cupboards). The video here has been sped speedling spedded up, some sections at eight times human, others at a wholly alien sixty-four times Norman. With conversation thrown into the bargain the whole operation took damned near a couple of hours, but you can travel along with us in about four minutes, if you think it fit. 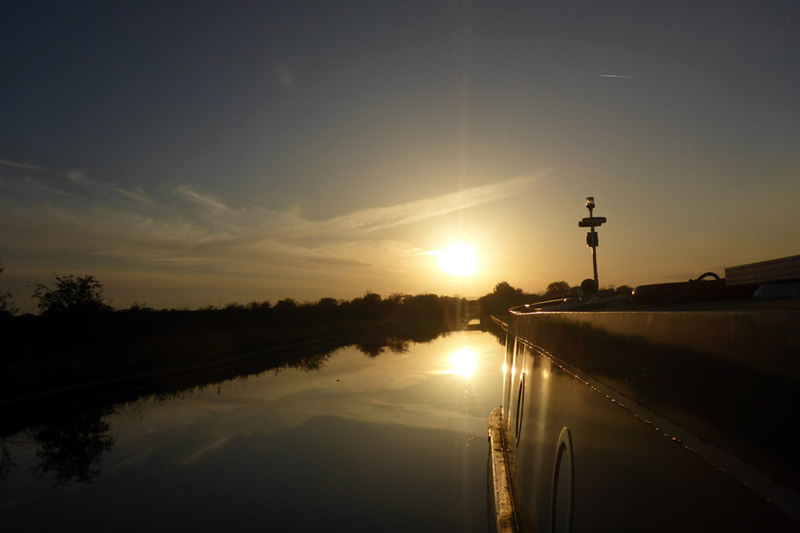 I’ve moored here the better to let our solar panels feed – no overhanging trees – and because, whereas the previous mooring was between high banks, this is open, wide open, with horizons. Yippee, claustrophobia was beginning to gain on me. Claus is very like that, you know, he’ll take advantage wherever he can with a phobia. A few days here and doubtless my contrary psyche will begin to suffer from angoraphobia, which I think is either the fear of open spaces or of rabbits or fluffy pullovers or something. I seem to remember that Angora was the Aunt in BeWitched, too. Angora doesn’t half get around. It’s the open spaces, do you see? They lend themselves to getting around. The moon has shown himself this evening – an almost full-faced, bright moon with quite distinct eyes, nose and mouth. A full-ish moon in a clear sky – means a cold night. The stove is lit (extra coal was obtained at the services) and the Cardinal is indeed making those creaking sounds that he makes when the outside is cooling down rapidly while the cabins are toasty toasty. Dinner, you’ll not be surprised to learn, is to be a vegetable “Rogan Josh” with (evil) white rice and a large glass of cool water (straight from the hosepipe of the services). After that, mayhap another chapter or two of Hornblower, and then to my cabin where my duvet awaits. Tis to be hoped that you all had as splendid a day as did the Cardinal and I. One can but hope. I do hope. Hope is important, isn’t it? Hope springs eternal. I had hope springs in a car that I owned many years ago, and the ride was quite amazing, although the car proved anything but eternal and had to be replaced on the usual schedule (when the doors fell off). What was the name of the aunt in BeWitched? Chin-chin, bottoms up and don’t spare the port decanters. The starboard decanters look quite tempting too. I did enjoy the video, it was so relaxing for me. Yep, definitely Aunt Clara! I felt the claustrophobia in the lock, such a narrow space and the speeding boats sent me a bit dizzy – well dizzier than I usually am. Couldn’t believe just how many boats there were in the one place, is that a Marina? How does an itinerant chap receive mail? Say someone wanted to send him a book, is there a P.O Box or are you getting stuff dropped in my parachute? Those speeded up bits are exciting! Who would have though narrowboats could go so fast. I didn’t know there was an aunt in Bewitched, but the evil mother was Endora (not to be confused with Andorra, a small country somewhere in Europe, maybe). I actually remembered all that unaided, but checked the spellings on the venerable Google. Agatha was one of the aunts, wasn’t she? Or maybe she was the mother… I forget. I suppose this is what Google was invented for. Be right back…. No Agatha. Damn Google for exposing my lapsing memory. I love your videos by the way. 🙂 They always relax me. I do believe Clara was one of the aunts. Funny thing the lady who played Esmeralda ( Alice Margaret Ghostley ) was a friend of my husbands. I never got to meet her but I heard lots of good and funny stories.